A compelling composition of Asian and contemporary themes gives this Rustic Zen kitchen its memorable style. 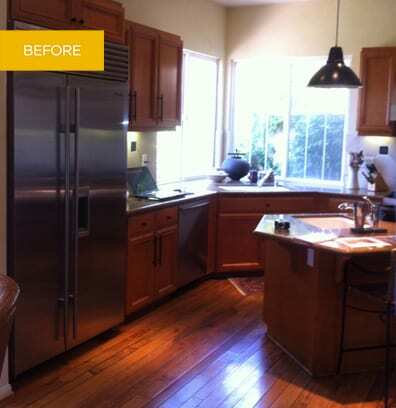 The original kitchen was unremarkable with a bland design and a layout that neglected the room’s gorgeous canyon views. While the room was a decent size, all the elements seemed to be cramped into one corner, creating a cluttered feeling and wasting space. The clients wanted to express their affinity for Asian-style design in a memorable environment with notable design elements. Meticulous about visuals, the clients wanted a kitchen that better reflected their taste. 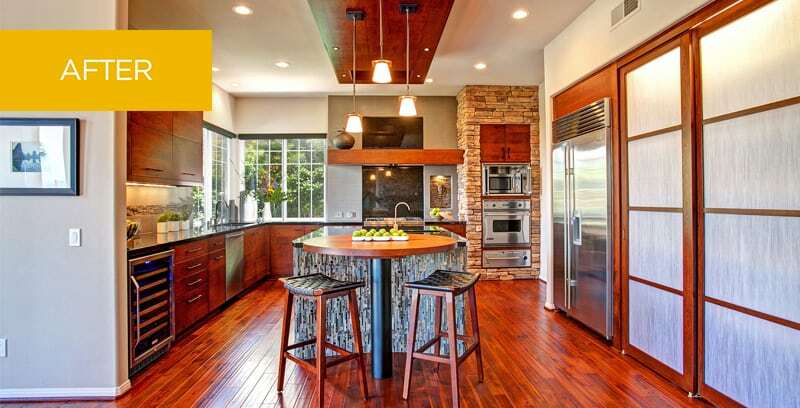 They also love to cook and desired more functional space for prepping and cooking, especially for cooking together. The high gloss sheen of black granite countertops is balanced by rustic notes of stacked natural stone, cherry wood and mahogany for an overall impression of subtle glamour with an Asian influence. The thoughtful blend of visual and textural elements creates an elegant, welcoming atmosphere rich with sophistication.